Cardi B FaceTiming Her 'Significant Other' ... Offset!!! Cardi B and Offset are showing all the signs of a couple deeply in love (all over again) ... sharing smiles and giggles on FaceTime. Cardi touched down at LAX Thursday with a big grin on her face and her phone in hand. The person on the other end? Offset! Our photog spotted the Migos rapper on Cardi's screen and asked who it was ... Cardi's response ... "My significant other." 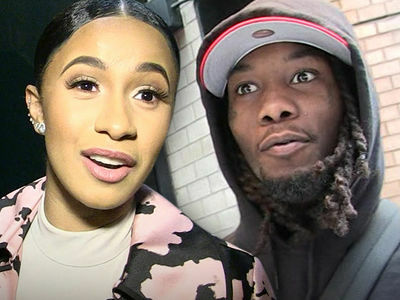 TMZ broke the story ... Cardi's planning on moving back in with Offset in their Atlanta home. She hasn't been back to the crib since December. You'll remember, Cardi -- very publicly -- split with her husband at the end of 2018 ... but the couple has been on the mend ever since, celebrating Christmas together as a family and taking a wild ride﻿ in Puerto Rico. Cardi tried her best to hide her face at LAX ... but love was certainly in the air.